When it comes to products related to cannabis consumption, a rich universe of options continues to scale up around oils and edibles. Sure the business of growing dried flower for smoking continues to grow. But even more rapid expansion of product offerings await cannabis and CBD shoppers who want to avoid burning their product to consume it. As a specialist in extracting oil from cannabis, Valens GroWorks Corp. (VGWCF finds itself preparing for a future with many, many more cannabis products. "Five years down the road, you'll go into a store and you'll buy a mint and you won't even know it has CBD in it," said Everett Knight, executive vice president, strategy and investments for Valens GroWorks. "You'll go to the pharmacy and get a pill and it'll have CBD or THC in it. It'll be common for people to have vape pens, or for others to have a gummy bear or chocolate bar, and cannabis infused beverages that look like a cocktail." Knight joined Valens GroWorks in January after working as a portfolio manager running a small-cap fund and a cannabis investment fund partly because he believed the company is a major beneficiary of medical and adult use cannabis in Canada, globally, and potentially the U.S.
"I managed a small-cap mutual fund for six years and we were one of the first in Canada to invest in the cannabis space," Knight said. "Then we launched the first long-only institutional cannabis mandate in Canada. Early on, we were investing in primarily cultivation companies but over the last year and half we became attracted to ancillary cannabis businesses, in particularly extraction. With superior margins and trends showing growth in oil derivative products, we saw extraction as a large bottle neck and that's why I joined Valens. It was the top weight in our portfolio. It became a big go-to name for us as it was so much further ahead than its peers." Knight said he's as convinced as ever of the macro trend of edibles and vaping over smoking because "no doctor wants you to smoke because smoking is not good for you." He's already observed trends in states with legal cannabis such as Colorado as a road map for the potential for oil extraction in Canada and many other markets. In 2015, dried flower comprised roughly 75% of the legal market. In 2018 it was 50-50 edibles/oil and dried cannabis. In time, we believe the market for non-smokable products will grow to 75% edibles and oil and 25% dried cannabis. "That's our core belief at Valens and that's why we are pushing the boundaries in R&D and product development driving higher margins and higher growth," Knight said. With an eye on this opportunity, Valens GroWorks recently expanded its oil extraction capacity to 240,000 kilograms a year, more than triple its earlier capacity of 72,000 kilograms. 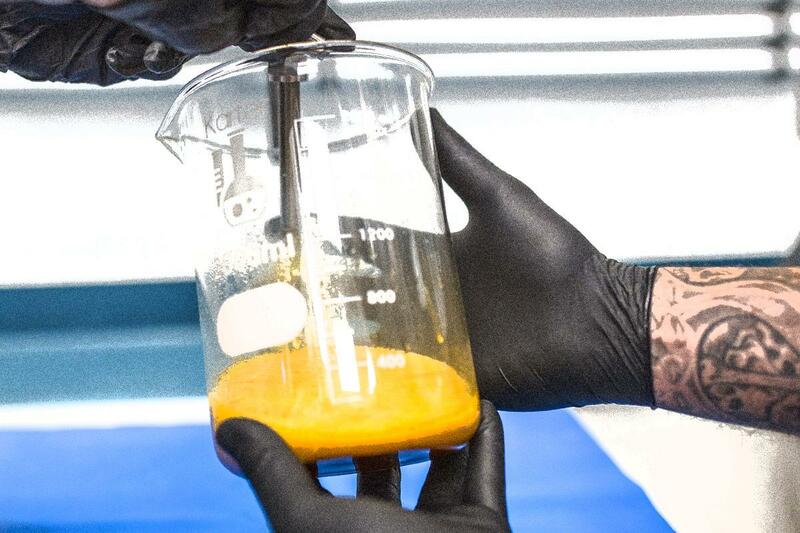 The increase has made Valens the largest third-party extraction company in Canada to not only meet the needs of its Canadian customers but the global cannabis marketplace, Valens GroWorks CEO Tyler Robson said in a statement. The company is readying for the legal sales of cannabis edibles and concentrates later this year in Canada, after dried flower became legal last year. In another major development for the company in recent days, it agreed to provide oil extraction services to Tilray Canada Ltd. (TLRY . Valens will extract a minimum annual quantity of 15,000 kilograms of dried cannabis and hemp (used to make CBD) for Tilray. Tilray became the seventh major extraction customer for Valens GroWorks including Canopy Growth (CGC - Get Report) , The Green Organic Dutchman (TGODF , Sundial Growers and Organigram (OGRMF . Valens wants to avoid having any one customer comprise more than 40% of its revenue stream by diversifying its customer base as much as possible. Looking ahead, Valens is tracking potential opportunities from new developments expected in the market. One trend gaining traction is using smaller amounts of THC in products to produce mild intoxication, and combining it with other ingredients to mimic the effects of alcohol. These micro doses are expected to become a big part of the future of the industry. While some customers may want the strength of a 100 milligram dose of THC, the sweet spot dosage may be closer to 2.5 milligrams to 10 milligrams in one serving for mainstream consumers seeking milder effects. "The average consumer doesn't want to get high out of their minds -- they want to feel uplifted," Knight said. "We're realizing from the data that there are going to be more balanced products out there." Some of the leading edibles makers in Colorado include detailed labeling about the strain of cannabis used in the product as well as THC content in order to create value, trust and consistency for customers. "The more the consumer gets to understand what is going into these edibles, the better it is," said Kayla Mann, marketing manager at Valens GroWorks. "Better labeling creates transparency. You need to know the plant that was used and how it was made. It holds companies accountable." CBD-based cannabis items won't get anyone high since it's a non-psychoactive substance but it is seen as a viable treatment for forms of epilepsy, as well as a food additive. "It's one of the most underestimated parts of the industry," Knight said. As cannabis production scales up and marijuana becomes more of an agricultural commodity, brands will become more important to offer additional value to producers and to customers. Valens GroWorks sees this an opportunity to offer its expertise in refining cannabis to accentuate thousands of combinations of ingredients in the plant called terpenes and flavonoids as well as THC and CBD content. Last month's announcement of Martha Stewart becoming an advisor for Canopy Growth signals the start of many more brand innovations to come in the space. Stewart is planning to work with the company to launch a line of cannabis pet products, another huge potential category. "As the market evolves towards consumer-packaged goods (CPGs) we view extraction services as a key aspect of the marketplace," said analysts at Haywood Capital Markets. "We are of the view that extracted cannabis and value-add products will be in demand over the next couple of years." Haywood Capital on Feb. 7 initiated coverage of Valens GroWorks with a buy rating. "Not only is the company set up for extraction processing into crude oil, it also has the ability to further refine these extracted products for various oil derivative products that are expected to be approved for the market later this year," Haywood Capital analysts noted. Fees from processing will drive revenue this year, followed by greater sales in white label products and Valens GroWorks branded products down the road, analysts noted. Haywood Capital analysts said Valens' "primary driver" of revenues will be toll processing in the near-term, followed by expanding to white-label products and possibly its own branded products at some point. "As the market evolves towards consumer-packaged goods (CPGs) we view extraction services as a key aspect of the marketplace," analysts said. Separately, AltaCorp Capital projects about US$32.6 million in 2019 revenue for Valens GroWorks and a steep rise to US$89 million in 2020. Valens GroWorks sees a role for itself in protein bars, sweets, trail mix, and other products, as well as cannabis infused beverages, oils for vaping, as well as myriad of health and beauty products. "There will be brands as big as Corona or Bud Light in cannabis," Knight said. "The future is all about brands and brands are built on the quality of the product." The role of cannabis oil will grow as the industry scales up and entrepreneurs come up with new products and categories. "It'll be commonplace and society is going to accept it, much like what happened with alcohol after Prohibition ended," Knight said. "We're working to help our extraction customers. If they succeed in their end product, we'll succeed in our business. We're a bit like Intel, with the 'Intel Inside' sticker on your computer. It's the engine that'll optimize the brand. Except in our case it will be 'Powered with Valens'." This content is not associated with TheStreet editorial team.